RIR presents 5 contemporary authors, each with military experience and individual views on duty, violence and the casualties of war. Military clashes in the Caucasus during the last two decades have spawned several moving Russian novels and memoirs. 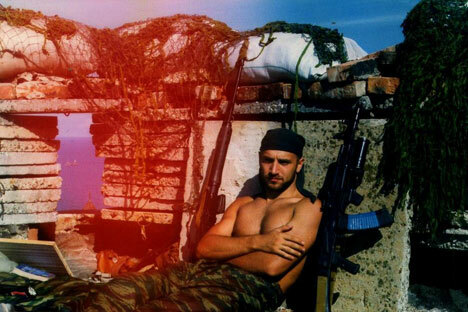 Zakhar Prilepin’s 2005 novel “Pathologies” drew on his own experience to depict a terrified, naïve paramilitary commander in Chechnya; German Sadulaev contributed another perspective soon after in his novel “I am a Chechen!” ; Arkady Babchenko’s “One Soldier’s War in Chechnya” depicts a brutal and confusing conflict. His unsparing descriptions of drunken beatings and bullying within the Russian army are particularly harrowing. “The Sky Wept Fire” has a haunting and defiant lyricism nonetheless. During the battle of Grozny in 1999, Eldin describes the “bones of ruined buildings” and likens the city to a mortally wounded animal, weeping “tears of smoke.” For Babchenko, the Chechen steppe has absorbed fear “like sweat” … which “hangs over the place like fog,” while Sadulaev’s Chechnya is a romanticized landscape, full of lilac and cherry blossom and flocks of migrating swallows. Authors like Mikhail Lermontov have celebrated the ambivalent beauty and bravery of this region for centuries. Alexander Pushkin’s narrative poem “The Prisoner of the Caucasus” was inspired by the landscape, which he saw as “a new Parnassus.” Leo Tolstoy’s story of the same name was the basis for a wildly popular 1990s film, directed by Sergei Bodrov. Babchenko felt compelled to volunteer for further active service in Chechnya, sucked back into the nightmare. In his memoir, conscripts are forced to dig their own graves on “a sunny June day, full of the intoxicating aromas of the steppe, … too beautiful for death.” Elsewhere, his dark humor emphasizes the soldiers’ suffering; the soft pages of a medical dictionary find a new use during an outbreak of dysentery, “the last disease that this fine medical reference book diagnosed,” Babchenko remarked drily. Combining scenes of war with peacetime tales, “Sin” is Prilepin’s only book available so far in English(although “Sankya,” the story of a young revolutionary, is due out in February). Prilepin’s namesake Zakharka in his stories goes through some of the experience the author himself had when he worked as a journalist and a special police squad commander in Chechnya. Eldin steps back occasionally from “human bodies ripped apart” or feral dogs feeding on fresh corpses to reflect on the struggle “to remain a human being.” When Eldin writes about torture, during an almost-unreadable section called “From the Wheel of Time into the Circle of Pain,” full of needles under fingernails and nights of recorded screaming, he switches to the second person. This forces the reader to share his experiences, both physical (“Naked wires are attached to your fingers and toes”) and psychological (“Here begins your tightrope journey across the precipice”). Tolstoy’s “Hadji Murad” began and ended with the image of a crimson thistle, crushed by a cartwheel but “risen again,” refusing to surrender. Russia’s contemporary writers continue this tradition of resistance and survival, from Makanin’s mountainous meditations to Prilepin’s attempts to redefine his homeland. Literature becomes an essential record and memorial. It serves to mourn the dead and tell their stories, to acknowledge complexity and to explore the desperate limits of humanity.